It’s that time of year when we tend to listen to our sweet tooth a little more. And I’ve got some recipes that’ll be sure to satisfy your holiday cravings. So as you settle in, whether it’s abroad or at home, share these recipes with your loved ones this season. Preheat the oven to 325 degrees. Paper-line 24 muffin cups and place one square of the cookie dough in each muffin cup. Bake the cookies for 10 minutes or until the cookie has spread to the edge of the cup. Beat the cream cheese, condensed milk, eggs and vanilla extract in a sizable bowl until smooth. 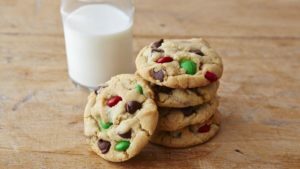 Pour around 3 tablespoons of the mixture over each cookie cup. Bake for an additional 15-18 minutes or until set. 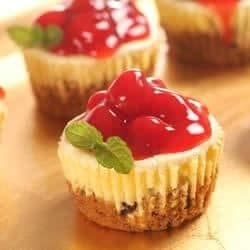 If topping cheesecake cookie cups with chocolate morsels, place them on top while cups are still warm. Then refrigerate for an hour. If topping with fruits, like cherry pie filling, wait for cups to cool completely, then top and refrigerate for an hour. Preheat the oven to 350 degrees. Line an 8-inch square pan with foil paper, then coat foil with cooking spray. Break apart cookie dough into a bowl. Add an egg and blend with an electric mixer until well-blended. (Or if you have brownie mix, follow the directions of the package.) Scoop batter into the prepared pan, smoothing the top. Bake for 35-40 minutes. Let brownie cool for 10 minutes. Then lift foil edges and carefully transfer out of the pan, until cooled completely. Combine powdered sugar, cream cheese, and butter in a sizable bowl. Blend ingredients with an electric mixer, for about 2 minutes until fluffy. 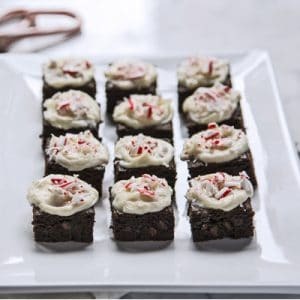 Cut the brownies into 16 pieces, then spread cream cheese frosting over each piece. Finally, decorate with finely crushed candy canes. Combine flour, baking soda, and salt in a small bowl. Beat butter, both sugars, and vanilla extract in a large bowl with an electric mixer until creamy. Add eggs, one at a time, beating well after each addition. Gradually add in the flour mixture. Stir in 1 cup or morsels and nuts. Use a spoon to scoop out cookie dough and drop onto an ungreased baking sheet. Bake for 11-13 minutes or until golden brown. Let cool for about 2 minutes. Prepare to make Apple filling: in a small bowl toss the apple slices with the lemon zest, lemon juice, sugar, cinnamon, salt and set it aside. In another bowl prepare to make the crumble topping. Mix the flour, brown sugar, oats and salt with a fork until it looks uniformed. In a baking dish, melt the butter in the microwave for about 10-15 seconds until it is half melted. Pour the butter into the flour mixture and use the fork to mix it in. Leaving excess butter in the baking dish, arrange the apple slices in the dish. Then top with the flour mixture. Bake for about 45 minutes until apples are golden. To make the caramel sauce, combine 1 cup of brown sugar, ½ cup of heavy cream or half and half, 4 tablespoons of butter, and a dash of salt in a small heavy-bottomed saucepan over a low-medium heat. Cook the sauce while stirring gently for 8-10 minutes, until thickened. Then add 1 tablespoon of vanilla extract and cook for another minute of two, until thickened again. 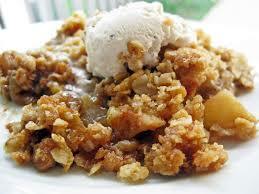 Drizzle caramel sauce over apple crumble and enjoy.